Liberty continues to evolve and this latest Avant kit is the best yet. Well designed and built to exacting high standards with unique lugs and a badge to be proud of. Well-made. Liberty's lugs allow fine adjustments. Tonal complexity. Fine finish. You may need to swap-in single-ply heads to get the best out of the kit. Liberty Drums was registered in 2006 by Andrew Street in County Durham. The company has expanded and is due to make its third move soon to a facility with twice the space. 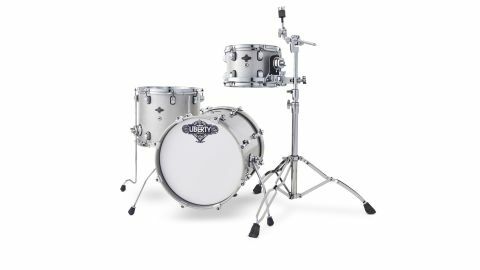 As with several of the UK's new wave of drum workshops Liberty makes its own shells from scratch and with the new Avant series we see Liberty's own-design lugs too. The Avant series is inspired by the Avant-Garde jazz movement of a half-century ago - small drums with a big sound. Bearing edges are a big factor in drum manufacture. They require careful and expert handling by the builder. Budget drums have good edges nowadays, but when you get the heads off a top series drum from one of the big boys you see the accuracy and sleek finish. "Immediately you know you are dealing with a well-crafted set of drums"
Well, Liberty's Avant has that. Immediately you know you are dealing with a well-crafted set of drums. The Avant's new-profile bearing edges are painstakingly finished, on a par with drums costing twice as much. Liberty calls the new profile 'Opex', which Andrew Street explains is based on the "full contact theory, where the curve matches the drum head collar". The sharp apex of the edge is 'ovaled' off to the outside, matching the arc of the drum head collar, therefore creating more contact between head and wood. Liberty makes all its own shells. The company uses a mixture of its own-design wooden moulds and hydraulic, alloy moulds to build shells from 6" to 26" in diameter and to any reasonable depth. Liberty invites potential customers to visit the factory and see its traditional shell moulding craftwork in operation. The accurately circular Avant shells are hand-selected Finnish plywood, the toms having 12 plies, but measuring just 6mm thick. The bass drum is bulked up to 15 plies and is 8mm thick. Inside, the inner ply is aligned vertically which aids sound projection and looks attractive with its swirling natural birch grain smoothly sanded and sealed. Finishes range through satin oils, lacquers in solid colours and sparkles, to inlays in split ply. The review kit is in Silver Glitter, which has a 90 percent sheen level. This figure refers to the order number of the lacquer - a more matt finish would be maybe 30 percent, while a full gloss takes from 90 to 100 percent for the wet look. Achieving the desired glassy finish is laborious, requiring wet and dry sanding between each coat. The glitter of the review kit (which includes the bass drum hoops) is an extremely fine sparkle with a professional sheen. Adorning the shells are Liberty's very own, custom-made, cast Beetle lugs. Previously Liberty has used a similar, though generic, lug design that Andrew says was too bulky. "So I had a company design and re-cast a slimmer and shorter version and re-styed the contours. I own the mould and patent of my Beetle-style lug." Other hardware is inevitably generic, but is all good quality. The hoops are stout 2.3 mm triple-flanged and the tension rods slip easily into the cast lugs secured by doubled-up chrome and black washers. The shepherd's crook floor tom legs and retractable bass drum spurs work well and the small tom comes with a RIMS-style chromed steel bracket. The 16" bass drum, being small, has a detachable lift clamp for your bass pedal. Such a small bass drum, at 16"x14", is always going to have a taut, clean sound. Liberty sent the drum with both heads jazzily intact, although the company will cut a porthole free of charge if you ask. But that kind of defeats the purpose if you are playing jazz. Andrew also included an EQ pillow inside, which doesn't come as standard. The batter was an unusual single-ply white Evans MS1 marching bass drum head, actually a good choice. With both heads in place and no damping the drum delivers a pretty hard bonk, which has its own attractions. But we experimented with the pillow and other, minimal damping against the inside of the batter. It didn't take much to tame some of the harder high-end, sufficient to get a deep-ish compact thump with additional tonal complexity from the single-ply front head. This will work in fast drum'n'bass-derived beats or in a more traditional small jazz context. When we think of 1950/'60s small group jazz we picture larger 12"x8" and 14"x14" toms with single-ply coated heads. These two toms, at 10"x7" and 14"x12", are more typical of modern tastes, especially when they come fitted with Evans EC2 double-ply clear batters. "We felt for a small kit with a jazz moniker, single-ply heads would be appropriate, so we swapped out the supplied Evans EC2s"
This is a modern sound which many like - it is well controlled for recording - but this writer finds it too blippy, thick and warm, with too soft an attack, particularly given the typically contained resonance of the birch shells. Don't get us wrong, the EC2s are perfectly good heads, and may well suit today's avant garde, maybe a more electronic, slick and constrained setting. But we felt for a small kit with a jazz moniker, single-ply heads would be appropriate, so we swapped out for standard Coated Ambassadors (other makes are available). This opened the toms right up. We admit this is a personally familiar and comforting reference point, but it also sat better with the single-ply white bass drum heads. Within a couple of minutes the whole kit was resonating and ringing (and we mean that in a positive way). With relatively small drums, just a half-turn is enough to go from fat and slack - right on the edge of rattling - to sharp and pingy. Slackened a little below mid-tension the drums sound bigger than their physical size suggests. The quality in the construction of the kit allows for this without the response getting sloppy or loose. This is where well-made drums show their class. Fine adjustment is crucial and the lugs behaved beautifully - super smooth, with each tension bolt fitted with double washers for stability. You feel in control. The accurately round shells and exact bearing edges make tuning that little bit easier and more reliable, so it is easy to explore the pitch range.